Though built about ten years ago, I don’t think I’ve ever come across the type-filled Wellington Writers Walk before. 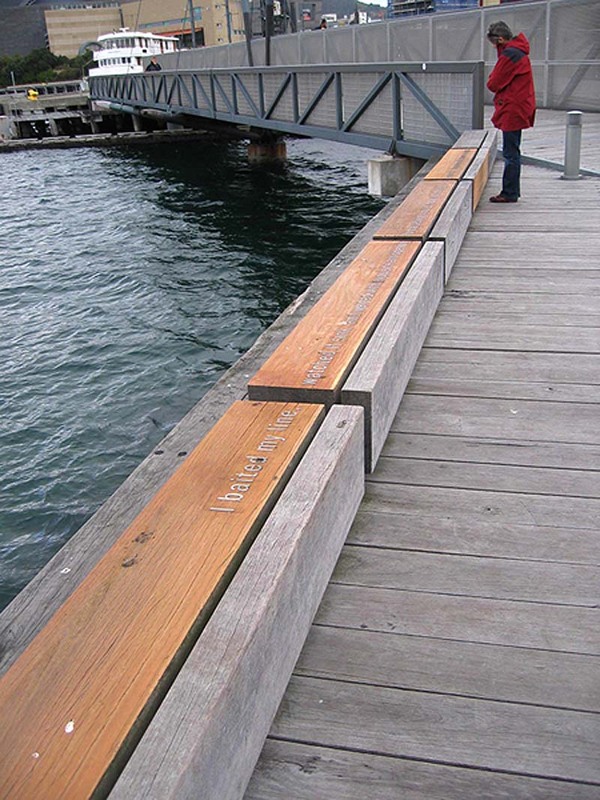 A project of the New Zealand Society of Authors, the waterfront park is full of bold concrete plaques and more subtle “benchmarks” emblazoned with 19 quotations from some of New Zealand’s best known writers, both past and present. The plaques have been designed by renowned typographer Catherine Griffiths and the benchmarks (some actual seats) by Wellington architect Fiona Christeller. Pretty impressive architypeture. Photos courtesy Wellington Writers Walk; Catherine Griffiths; Bruce Connew; and Jason Busch. This entry was posted in Architecture, Art, Graphic Design, Industrial Design, Stuff We Like, Typography. Bookmark the permalink.